Hitchcock's Vertigo takes quite a peek into the ever complex relationship between (wo)man and the city, more specifically the way in which the depths of the mind erupt the self to extend beyond one's imposed limit(ation)s and onto the environment that encircles it, that gives it its liveliness. It shows us a glimpse of how the sensible (memory and imagination among others) is distributed and materialized through the layered city (which is what gives it its layers). We can then understand the tower in the film as an architecture that is as much spatial as it is temporal; as hard of an object as it may be a constructed abstraction (history, too) of the psyche. More than an architecture it is that (mental) character of the everyday we've grown to inhabit quite elusively. A hightened everydayness that is both cyclical and linear — heights that we might describe as oscillations between the windmills of our mind and sources of power — an acrophobic cyclone between headspace and cityscape. What then becomes (of) the gravity of a(ny) constructed reality? In order to start thinking about what this question might mean, or how to go about answering it, let's first take a look at how the complexity of Hitchcock's Vertigo has been attempted — either to graze, grasp or unpack it — by filmmakers, critics, fans and others over 60 years, among whom I'd like to emphasize Chris Marker and focus on his take of H's film as narrated in one of his most notable essay-films Sans Soleil. Vertigo was one of Marker's favorite films and we see many of its themes present in his work. “I'm writing you all this from another world, a world of appearances. In a way the two worlds communicate with each other. Memory is to one what history is to the other: an impossibility. “Legends are born out of the need to decipher the indecipherable. Memories must make do with their delirium, with their drift. A moment stopped would burn like a frame of film blocked before the furnace of the projector. Madness protects, as fever does. “[O]nly one film had been capable of portraying impossible memory—insane memory: Alfred Hitchcock's Vertigo. In the spiral of the titles he saw time covering a field ever wider as it moved away, a cyclone whose present moment contains motionless the eye. “It seems to be a question of trailing, of enigma, of murder, but in truth it's a question of power and freedom, of melancholy and dazzlement, so carefully coded within the spiral that you could miss it, and not discover immediately that this vertigo of space in reality stands for the vertigo of time. “Hitchcock had invented nothing, it was all there. Here then are a few exercises to think through this film and the many complexities it reveals, complexities and contradictions of any design — the necessary consciousness and cognitive abilities and tools — to construct a reality. Let’s consider a different scenario — where the character of Madeline is both an extension of the city and its protagonist. As in H’s other film, Rear Window, made four years prior in 1954, the city is very much present, an omnipresence that enables and capacitates liveliness (life + love), both as source and height of it. Albeit at a different scale (the neighborhood block in RW and city-wide in V), the city is portrayed as an everyday totality. It is both context and character — a character which contextualizes and a context which characterizes. It is the physical space-time where psychopathologies play out and where phobias and philias (fetishes, even) are heightened and transposed. If in RW, we experience the block through voyeurism (a philia), the city in V disorients elliptically (through acrophobia). Inversely, we could also say that these philias and phobias are experienced or lived in and through the city. Though both psychopathologies emerge from a condition of damage or isolation, the main (and male) character's passive-aggressiveness finds a way to channel his repression through the character of the woman. In both films, she is the one taking risks and for a moment she constructs her own reality (or does she?). By heightening her strength and independence as such, H is actually constructing the imaginary reality of the protagonist, his perceived power, as to anticipate the demolition of both at the end. Reality constructed by one's repressed lines of control (H's too) and punishment becomes one of gaze here — it is the "cyclone whose present moment contains motionless the eye." It consists of falsifying the differences and nuances between perception, imagination, and memory of both man and woman — and more importantly those of the power and freedom between them. The haunt of one's past hunts the reality of the other. Madeline's strength and independence makes her a sacrificial offering. Her reality constructed in such a way puts her in a double-bind. What then is her gravity here? It is through (per H). Woman as a sacrificial offering is not new. The Albanian tale of Rozafa, the woman who was walled in order for the castle to stand, can be thought of as another example where a woman was literally holding a heavy load on her shoulders, the height and mass of a tower. 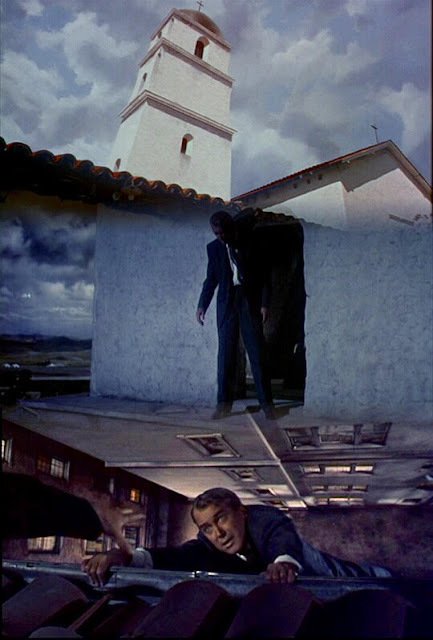 Hitchock's tower in Vertigo can be understood as both the context of the city and the character of the imagined or false reality of the protagonist. It can be thought of as an architecture of reality — a tool that heightens a(ny) reality (drawing its limits) and height as a weapon of a(ny) construction to (temporarily or permanently) suspend one's reality, hence the violence of gravity (psychopathology). Now, let’s go back and reread the above excerpts with this scenario in mind as a way to understand the film through the double-bind reality of Madeline — both the city and the imagined reality (psychopathology) of the protagonist, as (designers of) her reality. "a psyche ... desperately searching for an object on which to concentrate its repressed energy"
For more approaches to Hitchcock's Vertigo — the film and its director; the physical experience and the psychological condition (acrophobia); the elusiveness of the word, figure and image of vertigo in general; as well as how it materializes in the city and how the city itself creates it — let’s repeat Exercise One with other texts (mostly reviews) found here. That way we can grasp gravity as and through a multitude of things, characters, activities and contexts, in order to be able to ask the question and challenge the gaze upon which today's reality is constructed. This is more of a reflexive exercise, to sort of step back and see if at some point here you thought: what if there is no other character, other than the protagonist of course, which may be either man or woman, both or neither, and all this has been playing out in the character's (one's) head — that s/he has invented (falsified) a reality in order to confront and capture one's fear of loosing control of one's actual reality — which may or may not be real — but in doing so, one discovers the obsession s/he has accumulated in order to build up one's own real insecurities — which, in a way, may be the true culprit of this whole endeavor. What is the gravity of insecurity? How does one stand up straight? What is it to crawl? But, I may very well be overthinking it, so let’s move on. On the other hand though, I am specifically pointing towards a protagonist that may or may not be an individual, human, or natural — for example the state, corporations, capital, the public, AI, and so on. What then is our gravity, our fulcrum? How would we know how high to reach without becoming something else? What else could we become? This last exercise asks the question: What makes some of these recurring themes on or around acrophobia still relevant today; and, how are they played out in the city, your city? How might (spatial + temporal) vertigo shape your reality? Let's think of reality as the everydayness of both our livelihood and liveliness. How would you describe the acrophobia of your everyday? The concept of the everlasting illuminates the past. […] The character of the everyday has always been repetitive and veiled by obsession and fear. In the study of the everyday we discover the great problem of repetition, one of the most difficult problems facing us. The everyday is situated at the intersection of two modes of repetition: the cyclical, which dominates in nature, and the linear, which dominates in processes known as “rational.” The everyday implies on the one hand cycles, nights and days, seasons and harvests, activity and rest, hunger and satisfaction, desire and its fulfillment, life and death, and it implies on the other hand the repetitive gestures of work and consumption. Vertigo as a temporal dimension of constructing a(ny) reality might be as important as its spatial effects in the city and within us. How then are power and freedom negotiated at this dimension, and how do they challenge or accelerate the architecture of our reality as design agents?